We are now busy at Panyaden’s temporary school site getting the classrooms and offices ready for re-opening next Monday. We know how difficult this period must have been for many families, having to juggle work and other commitments with unexpected child care and we thank you so much for your patience and understanding. We are sure you and your children are looking forward to returning to school next week. We are very excited about seeing the children again! (See photos of preparation of temporary site here). 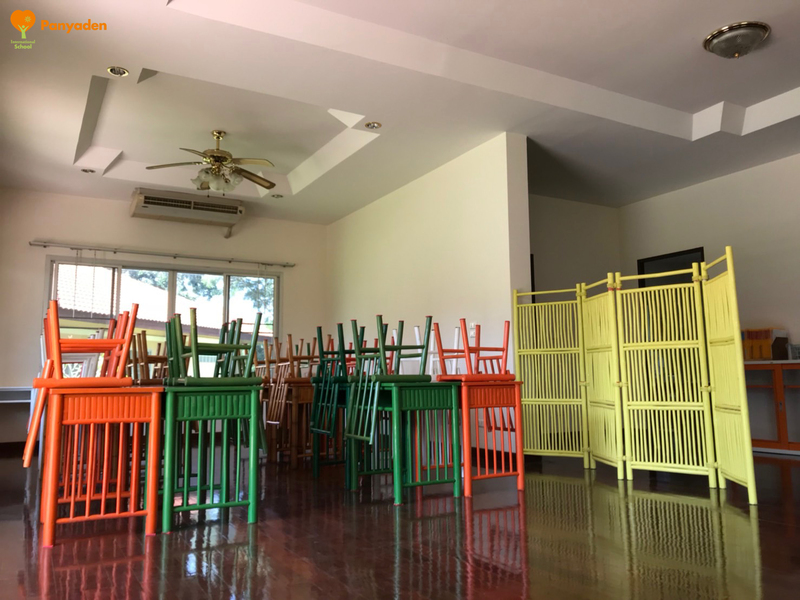 The Panyaden temporary campus consists of 5 two-storey houses in a walled compound. Classrooms have been assigned to the houses as shown below. There is plenty of green space, much of it shaded, so that children have no shortage of outdoors areas for break time, PE and Life Skills. The site is very safe, benefiting from walls and fencing between the compound and a pond. *The School Office/Parent Enquiries will be in House 1. 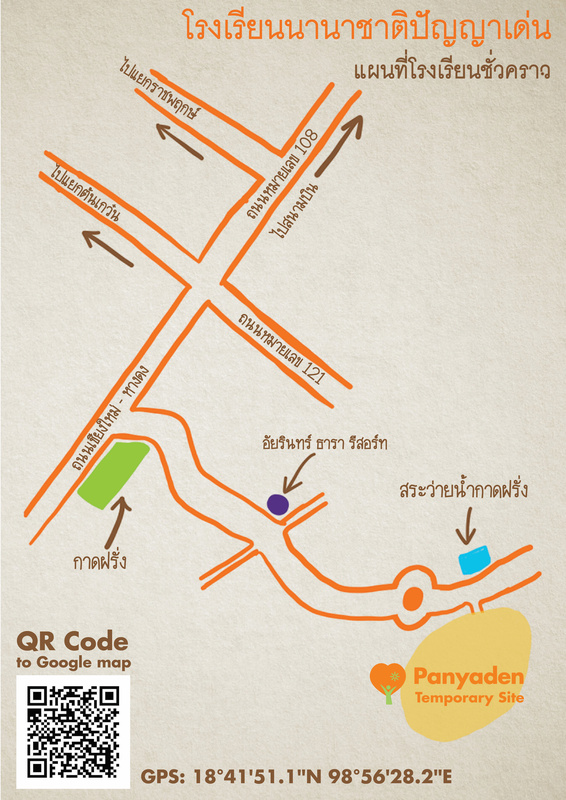 Below a map of how to get to the Panyaden temporary site. 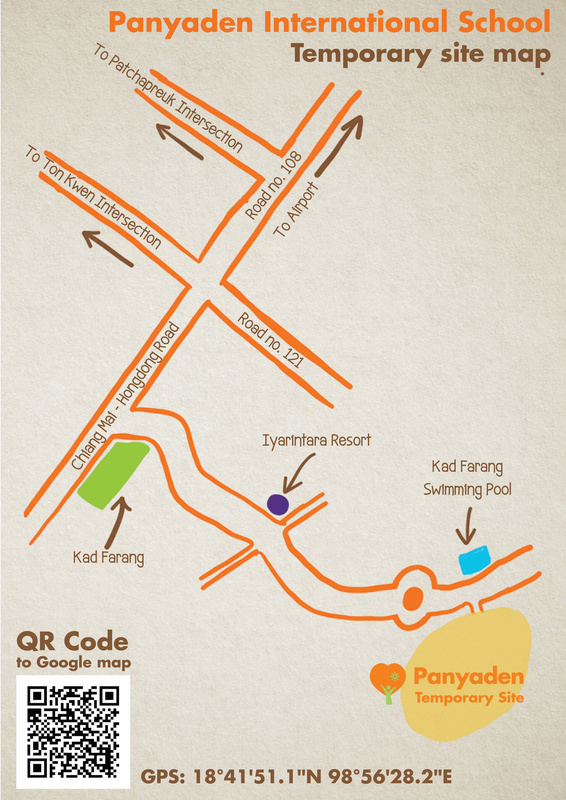 It is just a few minutes drive from Kad Farang. There is no parking inside the new school site, so parents are asked to park in the lanes outside. There is lots of space in the surrounding area, but it may mean walking further than your child is used to. To be safe, we recommend that parents either: a) drive past the school gate and into the neighbouring ‘moo baan’ before turning round and parking on the same side as the school, or b) turning right at the roundabout on the approach to school and parking along that lane. That way, children do not have to cross the road to get into school. On the first day, parents are welcome to bring their children to the classroom (we especially recommend this for younger children so that they feel secure in their new surroundings). After that, we strongly encourage parents of older children to simply drop off their children at the gate to avoid parking congestion. The daily schedule has not changed. Please drop off well before the bell at 8:20 and pick up between 15:15-15:30 (N-K2) and 15:45-16:00 (Y1-7) as usual. All After School Clubs will be running apart from swimming. This is because we do not have safe and appropriate swimming facilities for very young swimmers. Some clubs will change a little to suit the new environment – we will inform parents about those particular clubs accordingly. We will offer credit for the sessions missed during the two weeks (or more for the swimming club) which families may use against After School Club fees next term. Clubs will resume next week. Please inform your child that sandals or sports shoes must be worn at all times around the campus because the grounds are not as well kept as at Panyaden. Sports shoes for PE and Life Skills are an absolute must. We would like to remind you that the school’s spiritual advisor, Venerable Ajahn Jayasaro, will visit us on November 7th. Venerable Jayasaro will give a talk to the school community at 4pm at our temporary site. We will have teachers available to supervise your children. We see this as a very opportune visit after what happened to the school and we hope many of you will be able to make it. We continue to be overwhelmed by the kindness of parents, friends and well-wishers who have been donating cash, goods and services to the rebuild effort. We have so far raised over 3 million baht in cash donations – an impressive amount. This has come about through individual and business donations and fundraising projects by other schools, teachers, parents and local businesses. In addition to this, we have received book donations from schools, building material donations from parents, donated classroom materials from suppliers and lots more. All this has helped massively in reducing the recovery costs. Khun Tik, the school founder, has reaffirmed her commitment to getting Panyaden back up and running is working with advisors and banks to put together a financial plan that will pull together donations, insurance and bank loans to ensure the school will not only survive but continue to thrive and grow in the future. We still need lots of help and we are thankful for the continuing fundraising and awareness-raising. We are getting closer to a true estimate of rebuilding and restocking costs and will be sharing this information with parents as we know it. This entry was posted in Featured Posts, Others and tagged flood update, Panyaden.